James Edwards of Westbury Garage, Shrewsbury could not believe his eyes when he spotted on the internet a Saab that he thought he recognised as a local car being sold at a classic car auction in Chippenham, Wiltshire. Taking a trip to the auction in October he thought he would put a cheeky bid in for the car and was amazed to find he had the winning offer! He gingerly drove the car back through the Cotswolds and eventually back to Ludlow. Surprising his father the next day he was shocked to find out that his Mr Edwards senior had sold the car from new back in 1972 to a Mr Charlie Rodgers of Church Stretton. Even more surprising on searching through old records the original deal envelope was still in the archives with James Nan Nell's handwriting on the front. Mr Edwards senior recalled that James Nan, Nellie Sheffield had in fact helped in the office back in the seventies. 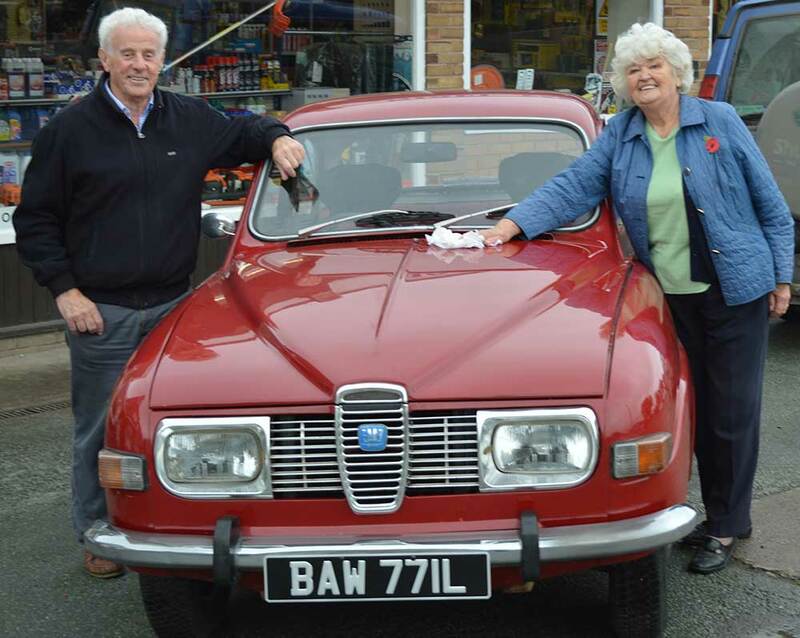 Mr Edwards said it is amazing to find such a car in immaculate condition as the Saab 96, he added this model won a number of RAC rallies with the late Eric Carlson in the late sixties early seventies. This also got the whole family thinking and after a bit of research found that Doris Williams who still lives in the village of Westbury would have cleaned the car at this time so without further ado James and his father tracked her down for the photo outside the original Westbury garage. The dealership which is now an all makes service centre is located in Featherbed Lane, Shrewsbury. James was hoping that people may recall the car in and around Church Stretton as Mr Rodgers was the first owner for over twenty years & hoped he could find some more records. He can be contacted on 01743 441445. See the story on the BBC and Daily Mail! New additions to our loan car family! 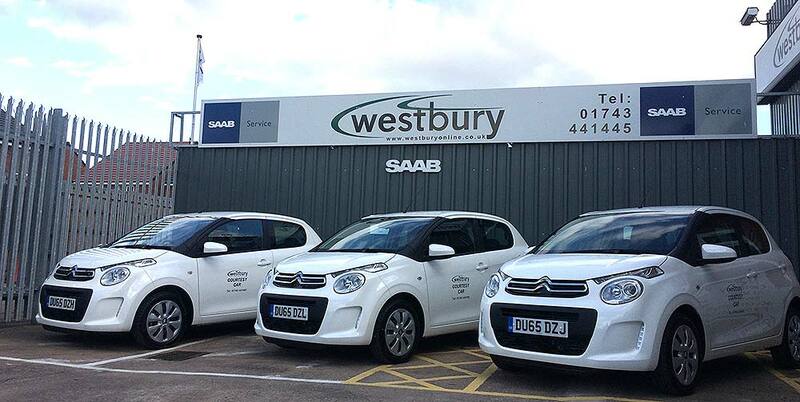 Westbury have just purchased 3 brand new Citroen C1 loan cars to add to their fleet. We now provide 5 free loan cars, more than many dealerships in the local area. All have the the latest Bluetooth features, air-conditioning and touch screen media centres etc. 1. Faulty/flat battery – this can occur when the connections to the battery aren’t connecting somehow, from a loss of voltage, or too many short trips which aren’t allowing your battery to recharge. 2. Lost keys – this can happen to anyone and is just one of those things, however all modern cars are fitted with an encrypted electronic chip to avoid theft, but this makes it harder to get a replacement key from the manufacturer. So make sure you have a spare key already cut to avoid being keyless completely. 3. Flat tyres – a flat tyre can occur to anyone at any time and can be a little bit of a pain. Make sure you carry a spare tyre with and ensure that it is in good condition with the correct tyre tread. The last thing you want is an unusable spare tyre! 4. Alternator faults – what do you look out for? If you have had regular battery issues and dimming headlights when idolised this maybe an indicator. If you are unsure it is better to be safe than sorry, so get it checked. 5. Starter motor – these are fairly reliable, however sometimes they fail. The best way to keep on top of this is for regular services. 6. Fuel problems – running out of fuel isn’t ideal and can cause many issues. Having an empty tank won’t get you very far, agreed. So when going on a longer journey make sure you fill your car before setting out and ensure you fill up before your warning light comes on. 7. Clutch cables – these are always under high pressure. They can slowly weaken and eventually break, this can often be without warning. A temporary fix can be made on the roadside, although it would be essential to get it to a garage as soon as possible. 8. Spark plugs – again there may not be a warning sign, so make sure it is replaced when stated in the manufactures service intervals. 9. HT leads – these deliver high voltage currents to the spark plug, sometimes deteriaitng due to temperature change and can go without warning, but a well maintained cars will be reliable. 10. Distributor cap – if already damaged it may be affected by damped weather conditions, causing a high voltage circuit shortage meaning the spark doesn’t reach the spark plug. With regular checks a damaged cap would be picked up. Now, don’t be disheartened by that list. The main way to avoid a breakdown is to make sure your car is maintained to a high standard. 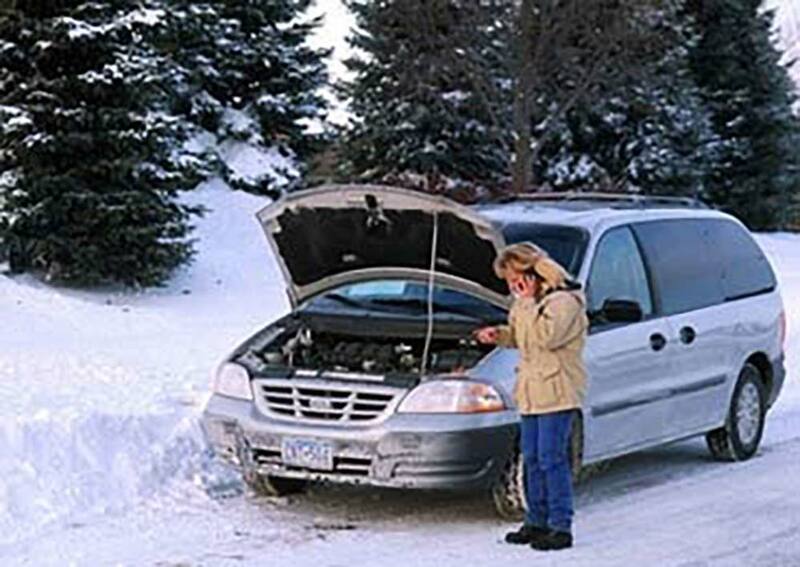 Westbury Garage are offering a free battery and antifreeze check on all makes and models, call us on 01743 441445.